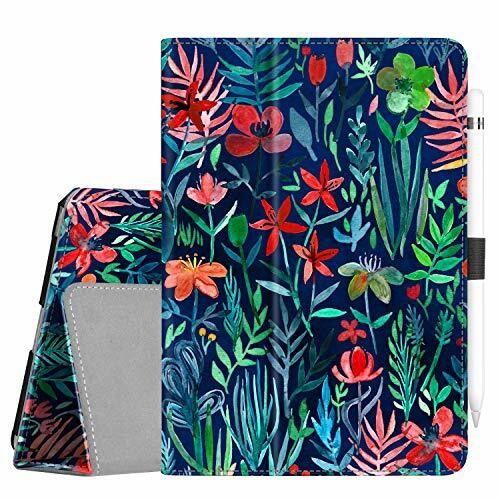 This Fintie Folio Case for your new iPad mini 5th Gen 7.9″ 2019 is a must have and perfect companion for an easy and enjoying life. This case sports a simple and classy design made from synthetic leather, and the interior is lined with non-scratch material so you don’t need to worry about any damages. Simply insert your tablet in the open pocket and secure it in place with the hook and loop fastener flap. There is also a magnetic strip built inside for a secure closure. Because the cover is uniquely designed to flip back and transform the case into a comfortable viewing stand, this capability allows the viewer to use the tablet hands-free whatever your position may be without strain. All features of the tablet are accessible even with the case on. This case is designed for Apple iPad mini 5th gen 2019 (model number: A2133/A2124/A2126/A2125), iPad mini 4 2015 (model number:A1538/A1550) ONLY; Will not be compatible with iPad mini 1/2/3, the original iPad,iPad 2,3,4 or iPad Air 1/2/3. Specifically designed for New iPad mini 5th gen 2019 (model number: A2133/A2124/A2126/A2125), iPad mini 4 2015 (model number: A1538/A1550). Built-in magnetic strip provides sleep/wake feature. Cut outs allow access to charge port and speakers. Headphones jack and volume can be accessed while in case. Stylus loop design works with Apple Pencil 1st gen or other stylus pen, keeps your pen always ready for you. Available in a variety of bright and fun colors.